I am sharing somewhat of a trip report from my vacation to New Mexico October 19-26th. After a tense time worrying about the Government shutdown, hubby and I enjoyed a week long trip and loop around Southern New Mexico. Dear hubby the spelunker’s main attraction was seeing the Carlsbad Cavern’s National Park. For me any vacation is a chance to see new birds. 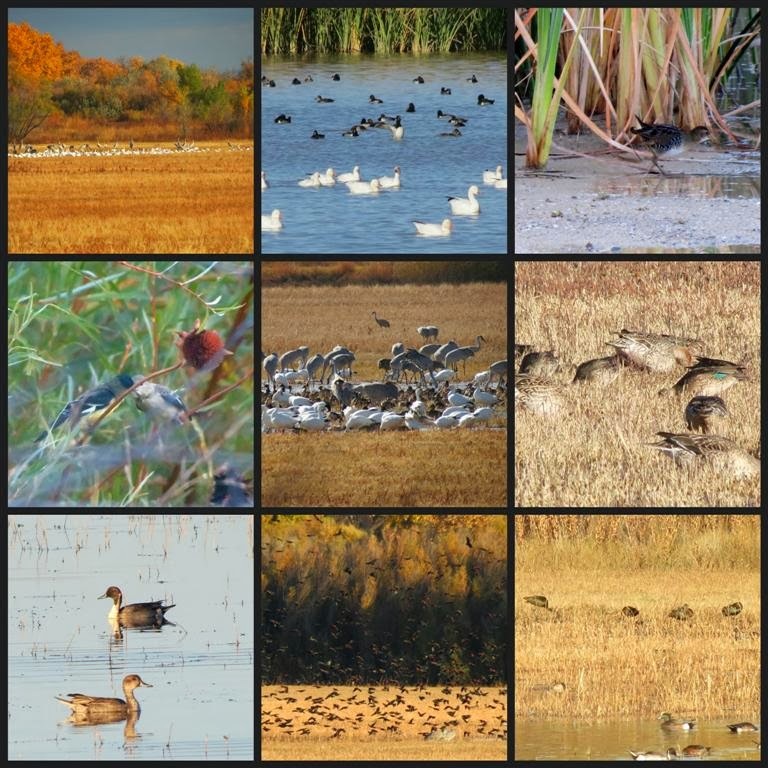 Before leaving, I spent a fun time searching the internet and using Ebird to find all the best spots for birding. I had target birds chosen and places to see them. 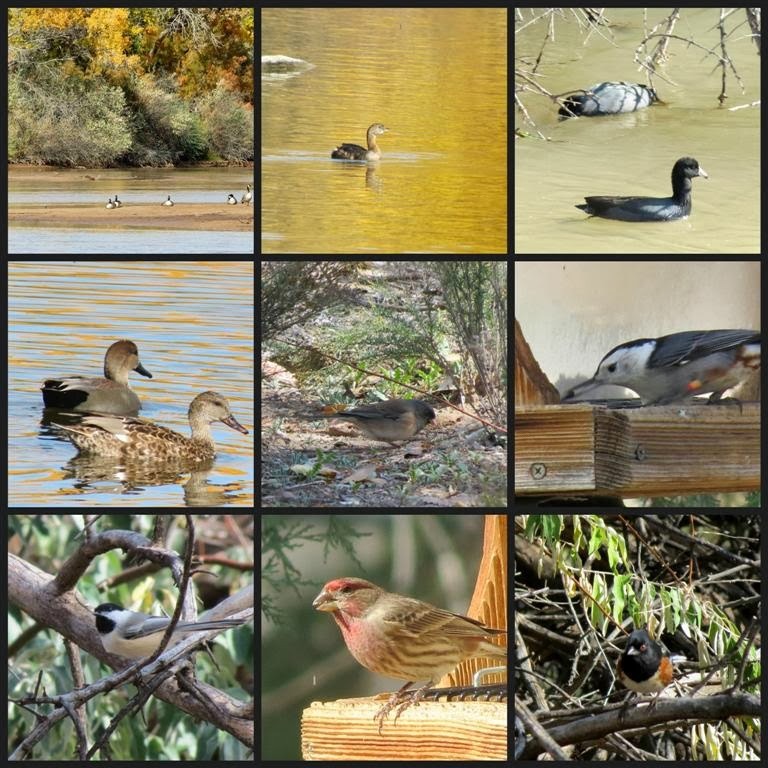 I found birding spots all along our loop starting with Bitter Lake NWR near Roswell..cool sighting of an American Bittern, Sandhill Cranes, Snow Geese and a Loggerhead Shrike. 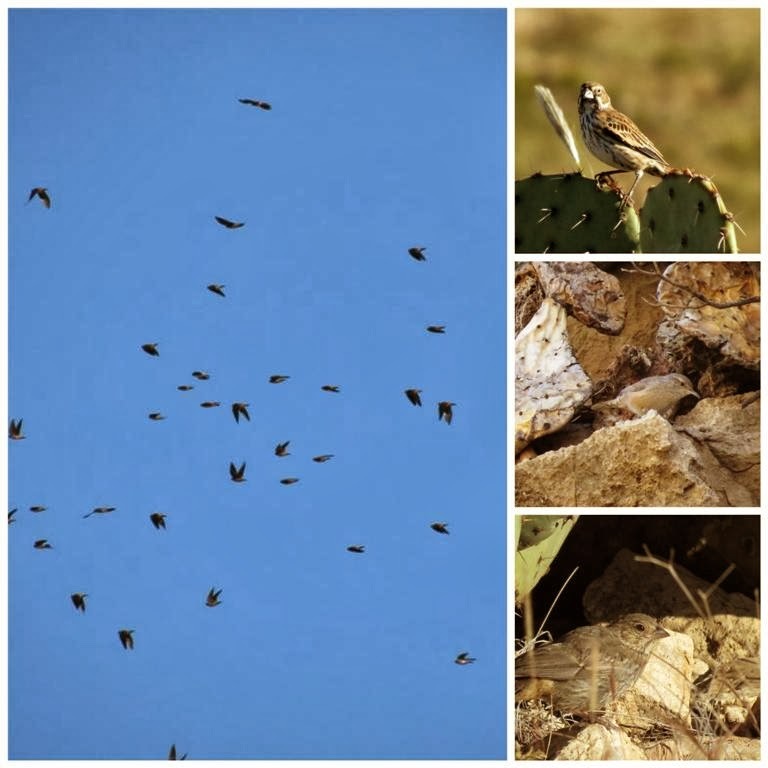 At Carlsbad Caverns Nat’l Park I found some birds around the visitor center, Rattlesnake Springs and at the Living Desert Zoo. It at these places I found my life birds the Cave Swallows, Lark Bunting, a Canyon Towhee and a Ladder-backed Woodpecker. 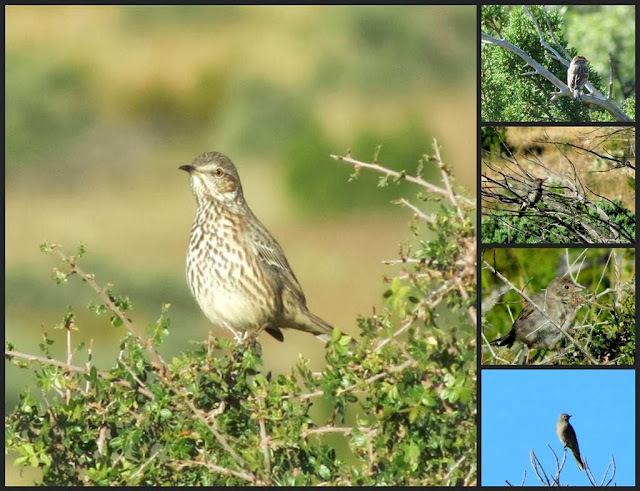 Guadalupe Mountains Nat’l Park was were I found the Sage Thrasher lifer. At this park I saw lots of Chipping Sparrrows, another Canyon Towhee, House Finches and the Red-shafted Flickers were pretty common. Caballo State Park first sighting of the Roadrunner and at Elephant Butte State Park I found my lifers the Western Grebe, Say’s Phoebe, Red-Naped Sapsucker and the Black Phoebe. Other birds seen were the Townsend's Solitaire, American Robin, House Wren, GB Heron, Rock Wren and a Red-tailed Hawk. 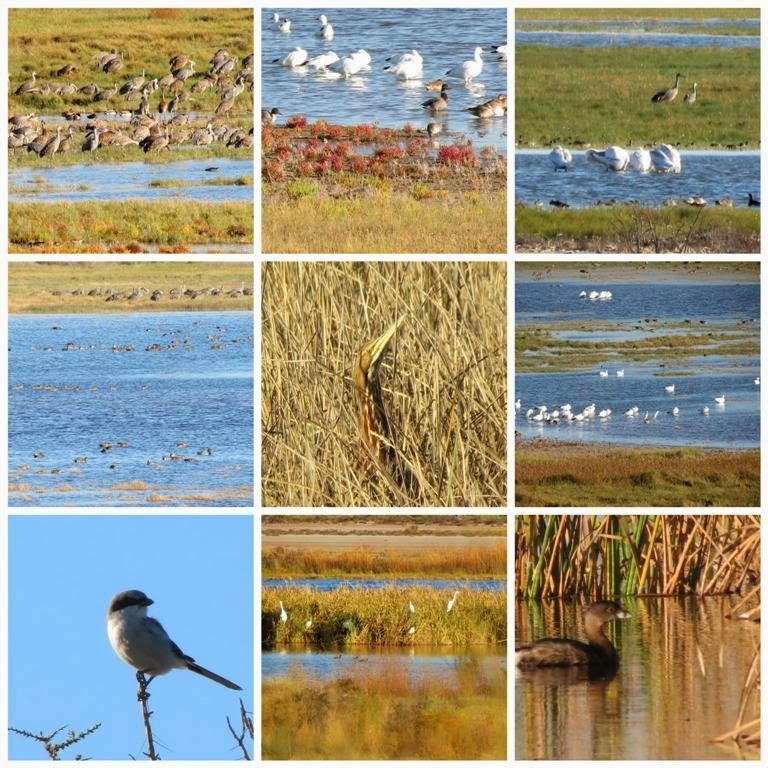 Bosque Del Apache NWR was great for the Roadrunner, Sandhill Cranes, Snow Geese and also for my lifer the Gambel’s Quail. Other birds seen were the Marsh Wren, Northern Harrier, Killdeer and White-Crowned Sparrows. On the second morning at the Bosque Del Apache NWR we saw more of the Sandhill Cranes, Sora, Snow Geese, lots of ducks like the Green-winged Teal and Pintails, Red-winged Blackbirds and a few White-faced ibis. Another life bird was the Lesser Goldfinch. I am pretty sure I see an American Wigeon in the bottom right. The Greater Roadrunner has been on my top ten list of most want to see birds. I was very happy to see the Roadrunner a few times during our vacation. 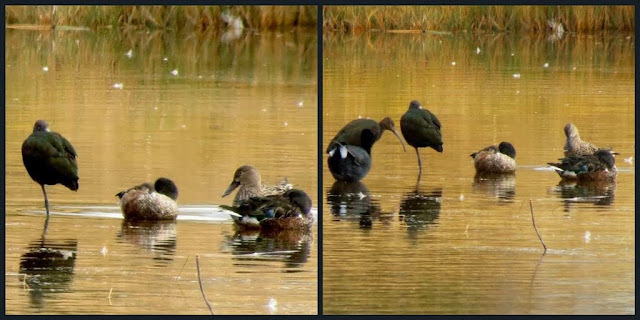 A quickie stop at the Belen Marsh...a couple of White-faced Ibis with some ducks. Rio Grande Nature Center & State park is a pretty park which gorgeous Cottonwood trees. We arrived later in the afternoon so I considered myself lucky to see any birds at this time of day. But we found a GB Heron, Canada Geese, Coots, Eared Grebe, Junco, Black-capped Chickadee, White breasted Nuthatch and a Spotted Towhee and lots of House Finches. I do have to admit, it was a tough time with id-ing some of the birds. I did have to ask for some help from the Facebook id group. Between seeing the first year birds, female and migrating birds and winter birds, it was a little confusing at times. The female Lark Bunting and the Canyon Towhee were the hardest birds for me to id. I could have spent a couple of weeks birding New Mexico. So, I am happy to share some of the birds I saw and my 14 lifers from our vacation. 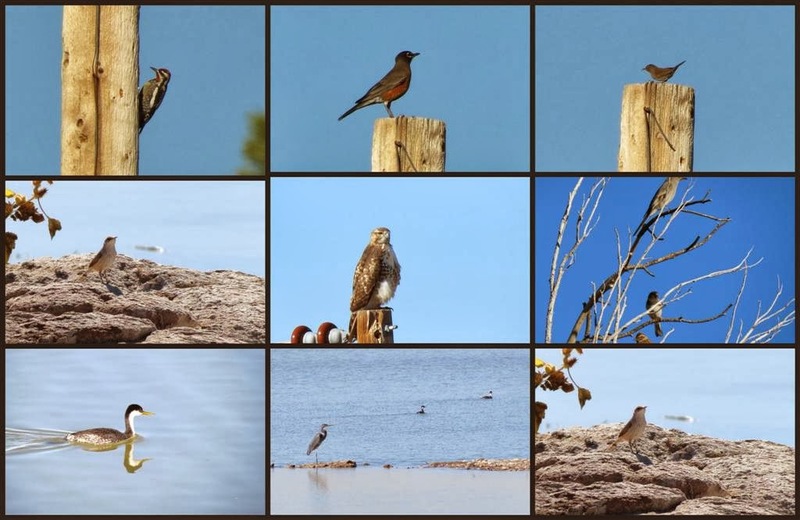 Thanks for visiting my post, I hope you enjoyed seeing my New Mexico birds. It's most enjoyable seeing the whole trip presented like this, Eileen, after seeing various other posts of bits of it. Congrats on the lifers Eileen. You captured some awesome birds on this trip and present them beautifully here, thanks for sharing. Impressive list of lifers. The bittern sure knows how to disguise himself. These are such difficult birds to photograph. What a wonderful trip you had! That is wonderful to be on another blog, well done Eileen. you truly packed it in! love the thrasher and the grebes and the quail! WoW eileen, you have shared the most amazing images and presented them so beautifully!! Amazing pictures and collages photos Eileen!!! You were so lucky seeing all kinds of birds on your trip!!! Great captures!! !Have a lovely new week!! Congrats! These places are treasures for birdwatching and you caught some real beauties! Wow you certainly saw a lot of birds and so many lifers too. Your New Mexico trip was definitely a success. Congratulations on all the lifers. Hi Eileen. What a wonderful trip and great selection of birds. Congrats on ' Lifers'. You hit the mother load. I was too young to remember my Carlsbad trip. Someday. Wonderful,so many are new to me...thank you Eileen! Beautiful photos Eileen and I'm sure it was a wonderful trip for you. How many birds do you have on your life list? So nice to get to see birds from totally different parts of the country. Thanks for sharing them with us. Congrats on all the lifers! You really had a good trip though......what an amazing group of birds you now have on your New Mexico list. 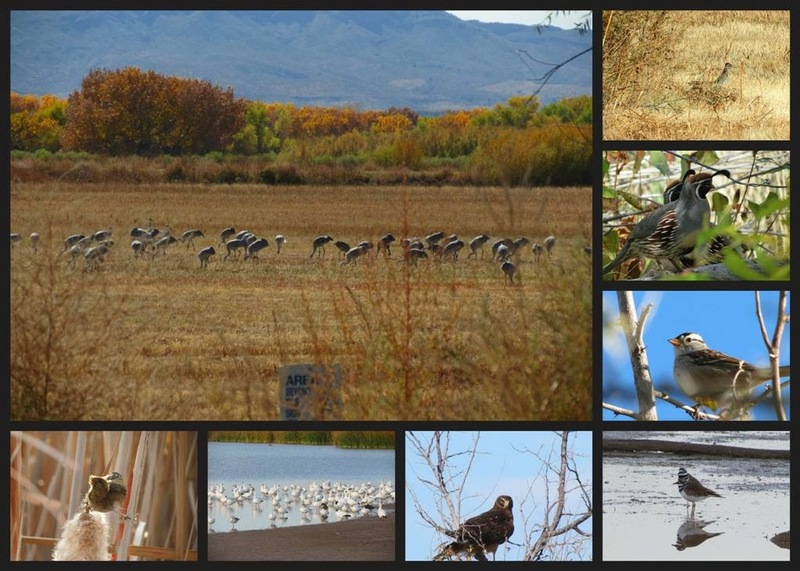 That Bosque Del Apache is one of my favorite places to bird......and there are more bird spots around that state that are incredible. Thanks for sharing you beautiful pics....love that place. ....you had great birding with a very productive trip! Lovely photos...exciting too! Hi Eillen.. Wonderful trip!!!.. So may creatures.. Love it.. I wish you a Merry Xmas and a happy new year.. A hug from Spain..
birding sure is fun!! i left a comment earlier!! This is fabulous Eileen. Thank you for linking it again as I missed it before.